May 16, 2018 By Liz 10 Comments Note: This post may contain affiliate links. 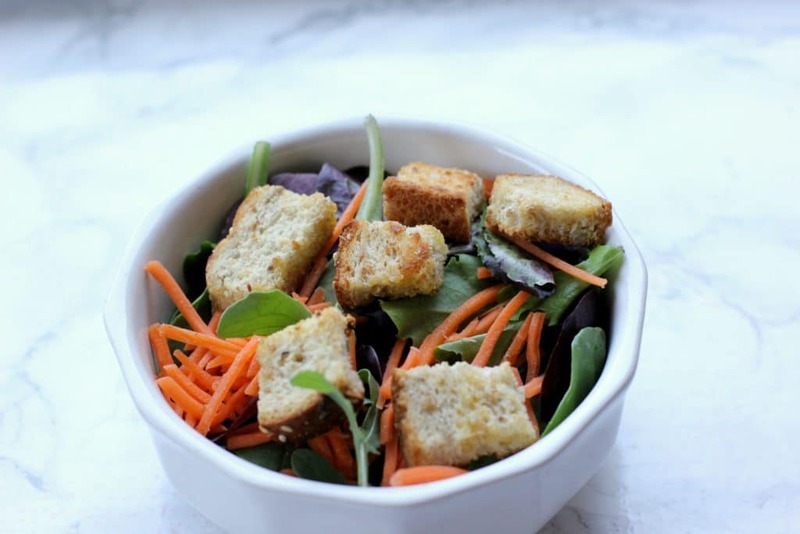 These homemade whole wheat croutons are easy to make and they’re perfect on top of your favorite soup or salad! Add a nice salty crunch to your next bowl of veggies! I eat a lot of salads. I try to eat one every day, if possible, because it’s such an easy way to fill up on vegetables. 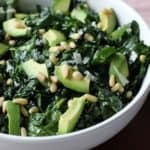 The trick to eating a lot of salads is switching up your toppings. I can’t eat the same thing over and over but I’ve got enough variation in my salad routine that I’m never bored. Croutons don’t have the best reputation. They’re not the noblest of salad toppings and most of them come out of a bag with more ingredients than I can count. If you have a bag in your pantry, go look at the ingredients list. You’ll probably see things like high fructose corn syrup and/or a bunch of words you can’t pronounce. I’m not here to demonize any ingredients, but isn’t it nice to know what you’re eating? With these homemade whole wheat croutons, you just need some hearty whole wheat bread, olive oil, and spices. 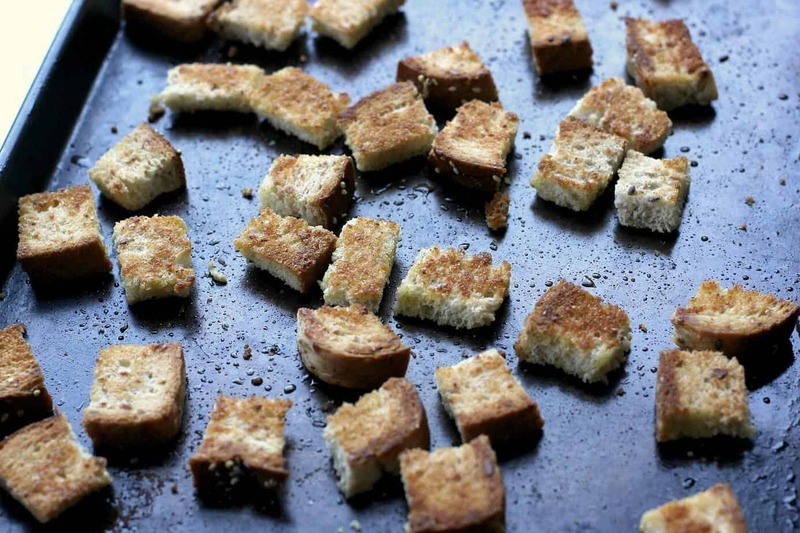 While some people might complain about the texture of whole wheat bread, it works perfectly for croutons. Try to cut the bread into uniform-sized pieces so they toast evenly. 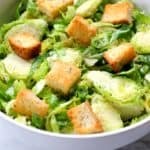 Olive oil spray is an easy way to ensure an even coating, but if you don’t have a spray bottle, just drizzle as slowly as possible and toss until the croutons evenly coated. Keep a close eye on them when they’re in the oven. Oven temperatures can vary and they’ll burn quickly! You want them browned but not too dry. Be sure your spices are fresh. They should smell fragrant when sprinkled on the croutons! I also like to use a flaky salt that gives these a bit more texture, but you can use regular table salt if needed. 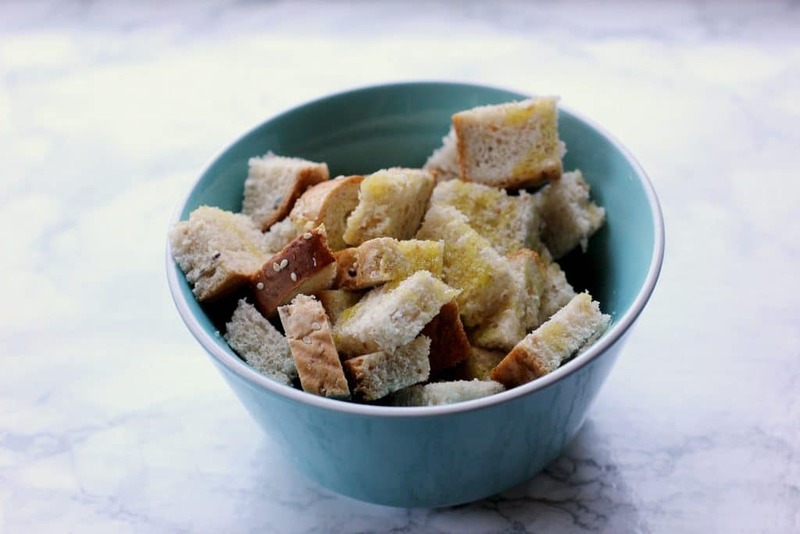 Homemade croutons are also a great chance to use up leftover bread! 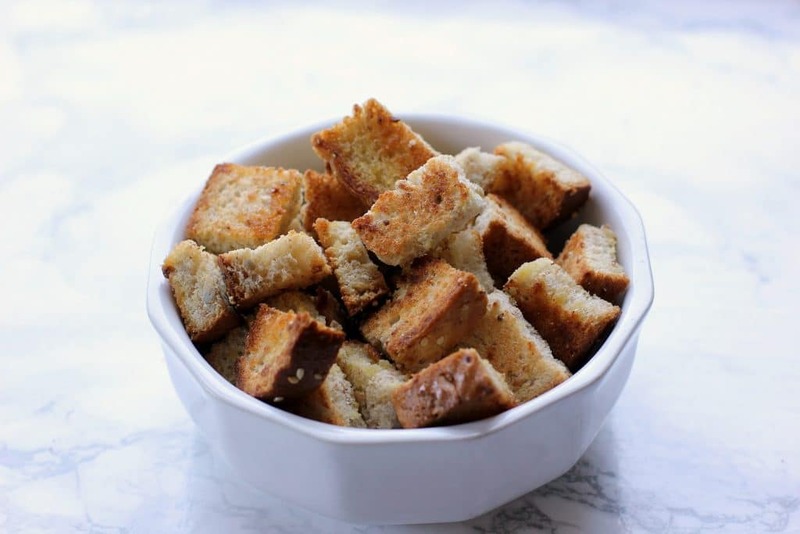 If you have a loaf that has started to go stale, use it for making delicious croutons! Slice the bread into 1 inch cubes. Toss the bread in a large bowl and drizzle with olive oil. You can also use an olive oil spray, which makes it easier to get an even coating. Spread in a single layer onto a large baking sheet. Sprinkle with garlic, onion, and sea salt. Bake for 8 minutes, then flip and continue to bake until brown. 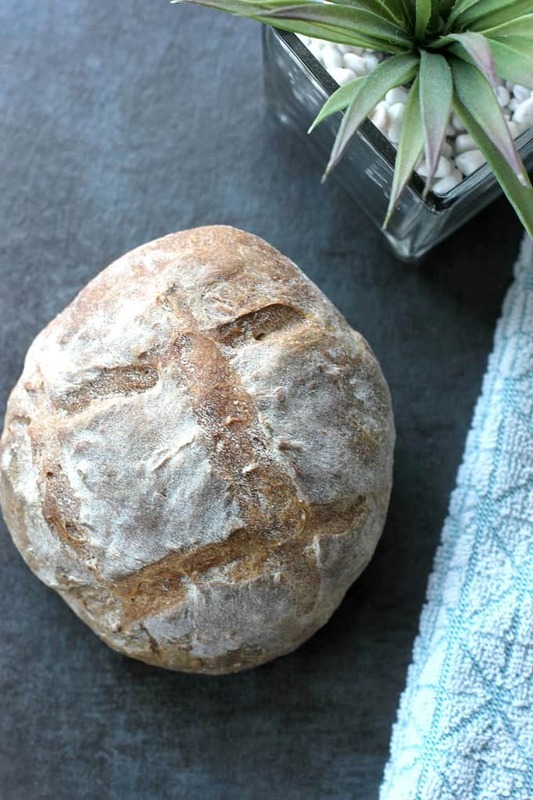 The total time will depend on the heartiness and freshness of your bread. Mine took 10 minutes total. If you don’t have a measuring spoon smaller than a 1/4 teaspoon, feel free to just use a pinch. It doesn’t have to exact, especially if you like a lot of flavor! You could definitely make these with gluten free bread, but the baking time may vary. You can also add any additional spices or seasonings that you like! I used Trader Joe’s olive oil spray to get an even coat of olive oil across the bread. You can also add additional seasoning and spices if you like! If you have Trader Joe’s Everything But the Bagel Seasoning, it would be perfect sprinkled on these croutons! These are delicious on top of a kale salad but they’re also great on top of a bowl of tomato soup. There’s pretty much nothing these little croutons can’t do! Homemade croutons make a world of difference!! 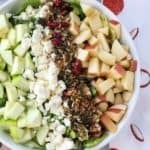 This recipe looks so easy and awesome! These croutons look delish! I love making most of my foods from scratch so this is a nice touch for a salad! This is great and super easy and homemade, this is recipe right up my alley. No more buying croutons from the store. Now I just need a salad to top these on! I love a good homemade crouton! I’m with you. I always make my own croutons to avoid all the additives in shop bought ones. I never thought to spice up mine though. I am so trying that tip next time I make some. Thanks. I hope you give them a try! They also taste so much better than the store bought ones! A salad just isn’t a salad until it’s topped with croutons. The saying goes homemade is best and that’s so true with croutons! I love how you’ve re-purposed bread that isn’t the best for sandwiches anymore! The simple seasoning is going to assure that these croutons will be good with any salad you’re making too and finally, NO PRESERVATIVES! That’s a biggy in my book. Homemades are always better than anything! 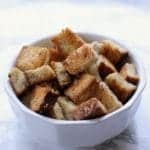 Thank you for sharing great homemade croutons recipe.